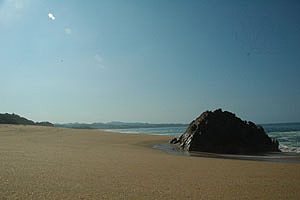 Finding a virgin pristine unspoiled beach that is accessible might seem only a dream in today’s world. I set out in search of one, and found it. 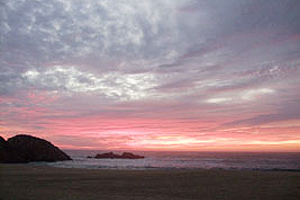 I have had the good fortune to explore many of the great beach locations of the world. It is a long list. French Polynesia, Tahiti, Bora Bora, Fijian Islands, Vanuatu, Tonga, Coast of East Africa, Lamu, Malindi, Seychelles, Praslin Island, Bird Island, Mauritius, North Africa, Essaouria, Cuba, Virgin Islands, Costa Rica, South America, Chilean Coast, The gulf coast of Mexico, Isla Holbox, Baja, Sea of Cortez and most of the Pacific Coast of Mexico. Some have not been mentioned or forgotten. To me the magic of a beach is measured by a huge wow factor, and the solitude and purity of the experience. A walk on the beach should be an escape from crowds of people and the daily grind. For me, a beach is a place to get recharged. A chance to dump the old stuff and make room for the new. Spending quality time on a beach is one of the best investments one can make. I always did my best work after discovering a new beach. All this is way of background as to why I found paradise on the south coast of Jalisco. Almost seven years ago, I started looking for a warm place to hang my hat. It had to be sunny and it had to be an easy travel day from the West Coast of the U.S. I wanted to have plenty of time to watch the sunset on arrival day. And, I was hoping for a virgin beach. After re-looking at some familiar places, I was becoming disappointed. Even the far away places that I had visited in past years were now discovered by the tourist crowds of the world. By chance and a fortunate conversation, I discovered a place that I thought no longer existed. A pristine, beautiful beach area that is unspoiled by tourism – yet accessible. 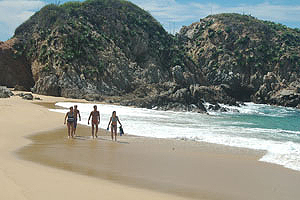 The south part of Cabo Corrientes along the Costalegre. Know as the Mayto area. I did not have to think twice about making a purchase, and I am now bringing to bear all my years of collecting beach experiences from the many places that I have stayed, along with my design background to create something very special at a place I call Chachalaka. A modern eco-smart place for today. Enjoy the month and keep exploring.